“Macroprudential policies are being extensively used to curb risks from high household debt and credit growth. 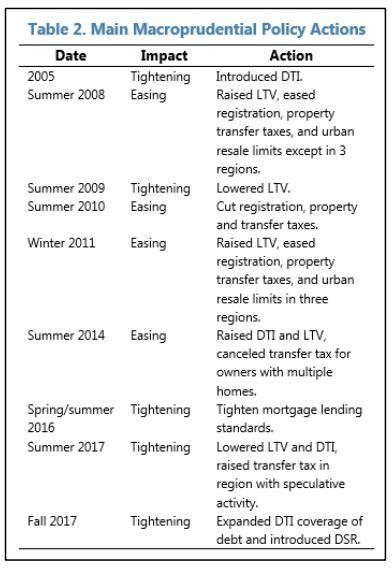 A broad range of macroprudential instruments that have been tightened and new ones introduced (Table 2). The loan-to-value (LTV) and debt-to-income (DTI) ratios were reduced to record lows of 40 percent, and are now well below recent highs of 70 and 60 percent, respectively, to which they were increased in August 2014. And, a lower level of 30 percent was set for borrowers with multiple mortgages and in designated regions of speculative activity, mostly around Seoul. In October 2017, the DTI was effectively tightened further by broadening the range of debt subject to it. Also announced is a new, debt service ratio (DSR) with comprehensive coverage of all household debts, which will be implemented for banks in mid-2018; and then for NBFIs at the start of 2019.